The State funeral of Their Majesties King Peter II, Queen Alexandra, Queen Maria and His Royal Highness Prince Andrej is going to take place at Royal Mausoleum of St. George’s Church in Oplenac near Topola, on Sunday, May 26. On Friday, 24 May 2013, from 9 am to 10 am the Liturgy will be officiated at the Chapel of St. Andrew the First Called at the Royal Compound in Dedinje. 10 am to 10.15 am the Requiem, then motorcade starts from the Royal Compound. On 10.30 am, remains of Their Majesties and His Royal Highness arrive to the Cathedral Church of St. Michael the Archangel (“Saborna Crkva”) in downtown Belgrade. 10.30 am to 10.45 am the Requiem. From 11 am on – citizens paying respect. On Saturday, 25 May 2013, 9 am to 11 am the Holy Liturgy at the Cathedral Church of St. Michael the Archangel in Belgrade. 11 am to 11.5 am the Requiem. 11.30 am remains of Their Majesties and His Royal Highness will be transferred from the Cathedral Church of St. Michael the Archangel in Belgrade, to the St. George Church in Oplenac. 1 pm arrival to St. George Church in Oplenac. 1.15 pm to 1.30 pm Requiem officiated by His Grace Bishop Jovan of Sumadija. 1.30 pm to 8 pm citizens paying respect. 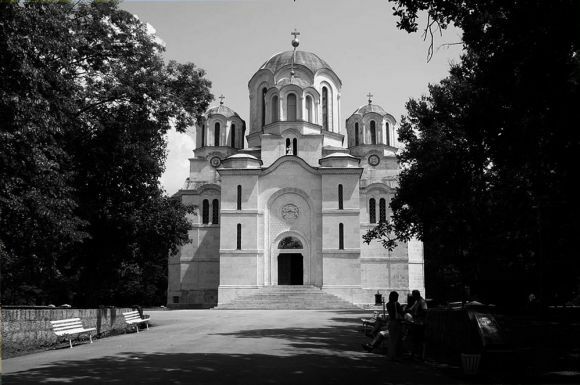 On Sunday, 26 May 2013, the State Funeral will be held in Oplenac, starting on 10 am with Holy Liturgy officiated by His Holiness Patriarch Irinej of Serbia and Bishops of Serbian Orthodox Church. The State Funeral ends on 1.30 pm.